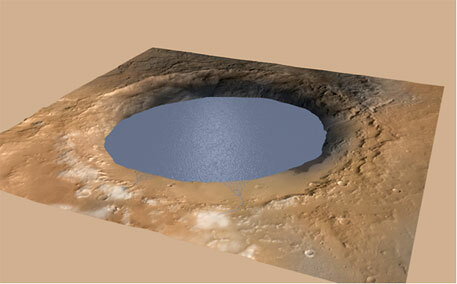 The planet Mars had large, long-lasting lakes of water on its surface instead of underground water that lasted only for a short time. That is the conclusion reached by scientists in the United States after examining the evidence sent by NASA’s ‘Curiosity’ rover, a press release by the agency on December 8 said. Curiosity, which landed on Mars in 2012, has traveled around 8 kilometres since then. It is currently stationed at the base of Mount Sharp, a 5 km-high mound that sits in the middle of the 154-km-wide Gale Crater. Curiosity’s observations indicate that 3.5 billion years ago, water could have filled much of the Gale Crater, and that Mount Sharp could have been formed by repeated cycles of sediment buildup and erosion. “We are making headway in solving the mystery of Mount Sharp. Where there is now a mountain, there may have once been a series of lakes,” Curiosity Project scientist John Grotzinger of the California Institute of Technology in Pasadena, California, was quoted as saying in the press release. Mount Sharp’s lower flanks expose hundreds of rock layers. The rock layers—alternating between lake, river and wind deposits—bear witness to the repeated filling and evaporation of a Martian lake much larger and longer-lasting than any previously examined close-up. Curiosity currently is investigating the lowest sedimentary layers of Mount Sharp, a section of rock 500 feet (150 meters) high, dubbed the Murray formation. Rivers carried sand and silt to the lake, depositing the sediments at the mouth of the river to form deltas, similar to those found at river mouths on Earth. This cycle occurred over and over again. After the crater filled to a height of at least a few hundred yards and the sediments hardened into rock, the accumulated layers of sediment were sculpted over time into a mountainous shape by wind erosion that carved away the material between the crater perimeter and what is now the edge of the mountain. “If our hypothesis for Mount Sharp holds up, it challenges the notion that warm and wet conditions were transient, local, or only underground on Mars,” Ashwin Vasavada, Curiosity deputy project scientist at NASA's Jet Propulsion Laboratory (JPL) in Pasadena, California, was quoted in the press release as saying. “A more radical explanation is that Mars' ancient, thicker atmosphere raised temperatures above freezing globally, but so far we don't know how the atmosphere did that." NASA uses Curiosity to assess ancient, potentially habitable environments and the significant changes the Martian environment has experienced over millions of years. This project is one element of NASA's ongoing Mars research and preparation for a human mission to the planet in the 2030s. “Knowledge we're gaining about Mars' environmental evolution by deciphering how Mount Sharp formed will also help guide plans for future missions to seek signs of Martian life," said Michael Meyer, lead scientist for NASA's Mars Exploration Program at NASA's headquarters in Washington. Curiosity is built and managed by JPL, which in turn is managed by the California Institute of Technology.